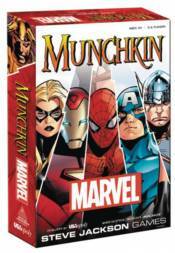 Steve Jackson and USAopoly are proud to present Munchkin: Marvel Universe Edition! Munchkin: Marvel Universe Edition fuses the card game with iconic characters from the Marvel universe and contains new monsters (villains), allies (heroes) and custom S.H.I.E.L.D. ID cards. The box set will also include 6 oversized S.H.I.E.L.D. Agent role cards, 168 Cards (including Door cards and Treasure cards), 6 level trackers, a custom die, and game rules. For 3-6 players, ages 10 and up.